Multiple person grabs are a common training tool in Aikido and are have a long tradition in our Budo. 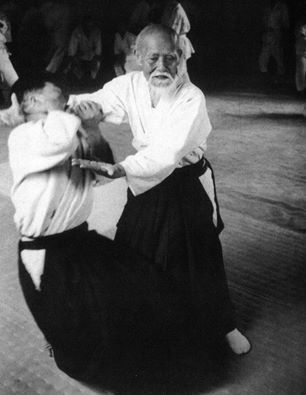 The Founder of Aikido (Master Morihei Ueshiba) regularly demonstrated and practised this form of training. There are numerous videos of him doing so, the earliest going back to the 1930’s. Two person grabs in Aikido practice are typically referred to as ninindori. Ninindori represents the basic form of multiple grab practice. As a student progresses additional attackers can be added to make the exercise more challenging. In the below video, Master Koretoshi Maruyama, Founder of Aikido Yuishinkai, demonstrates how to use kokyu nage (a “breath throw”) to escape when ukes in ninindori grab each arm of the nage. Morote tori kokyu ho was one of the three techniques O’Sensei taught at all of his classes. At basic level, the technique is practised against a uke who is offering resistance. O”Sensei considered that the regular practice of morotedori kokyu ho was essential to build an “aiki body“. Given the high emphasis that the Founder placed on morote tori kokyu, it is regularly practised at our dojo. In the below videos Morihiro Saito Sensei (9th Dan) demonstrates morotedori kokyu ho at kihon (basic) and ki no nagare (free flowing) levels. In the below video, Saito Sensei demonstrates how to apply Morotedori kokyu ho at a higher level free flowing technique. This level of application should not be attempted until mastery of the basic version has been achieved. In the following video, Saito Sensei explains in more detail the hanmi principles underlying morotedori kokyu ho. In the below video Saito Sensei demonstrates how Morotedori kokyu ho is applied if the nage commences the exercise with a tenkan movement. In the following video, Takashi Kuroki Sensei of Nishio Aikido gives instruction on an alternate approach to Morotedori kokyu ho. This approach is also practiced at our dojo.